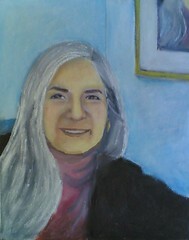 Today I fought the urge to run over to the studio and repaint the mouth and chin on my self-portrait. Instead, I decided to try the changes out digitally first. I used the photo of the most recent version of the painting, opened it in Painter IX, and then drew the changes in with digital pastel. I moved both the mouth and chin up by a small amount. That sounds simple, but this took a lot of trial and error and many tiny changes to get this far. It was painstaking and frustrating work. When I was almost done, I had the before and after images on the computer screen and was switching between the two to see which I liked better. This produced the effect of basic animation, like a flip book, and it looked like the mouth was moving. This made me laugh out loud, and reminded me not to take this project too seriously. Well, I think this version is now closer to the proportions of my face, though the smile still needs a little something. (So now I am back what John Singer Sargent said about a portrait being a painting in which there is something not quite right about the mouth.) I am very glad I did my little digital dress rehearsal, because I learned a lot. It is much easier to manage trial and error with digital pastel; there is no "undo" button with oil bars! The next step will be to try to make these same changes in the studio on the canvas. To be continued. . . .